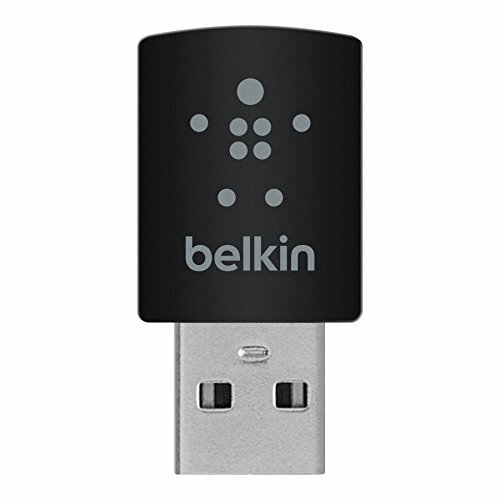 Connect your desktop or laptop computer to Wi-Fi with the Belkin N300 Micro Wireless N USB Adapter. The adapter features a compact design that doesn't get in the way when you're on the go and is easy to set up; just plug it into your computer's USB port and insert the setup CD. The Wi-Fi adapter is backward-compatible with 802.11g devices at 54 megabits per second and 802.11b products at 11 megabits per second. With a dual-band speed of up to 300 megabits-per-second and Wi-Fi protected setup at the push of a button, the Belkin N300 Micro Wireless N USB Adapter makes connecting to the internet quick and convenient.